Between work, life and everything in between, opportunities to go out and watch trains aren’t quite what they used to be, but I’ve been out a couple times so far this year. With one notable exception, for which I’m still processing pictures, usually I don’t see more than one train at a time, and I figured it was time to finally share some of those shots here. Somehow, I managed to avoid using the camera at all during January. At the moment, I’m not entirely sure why, but I know I had good reasons. 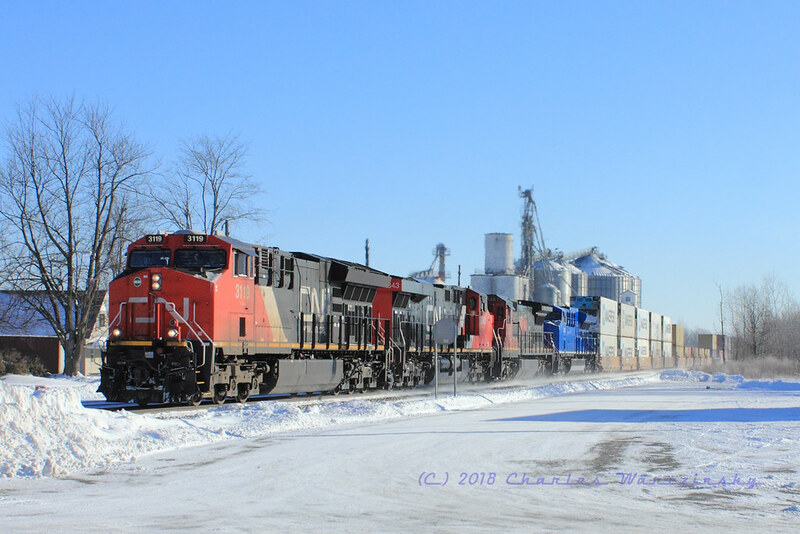 I did manage to shoot CN train Q149 (and some other numbers) a couple times in late December, but January itself was pretty much a bust as far as sharing things here go. Speaking of seeing Q149, how about a couple comparison shots showing the relative snowfall we received Christmas Eve? 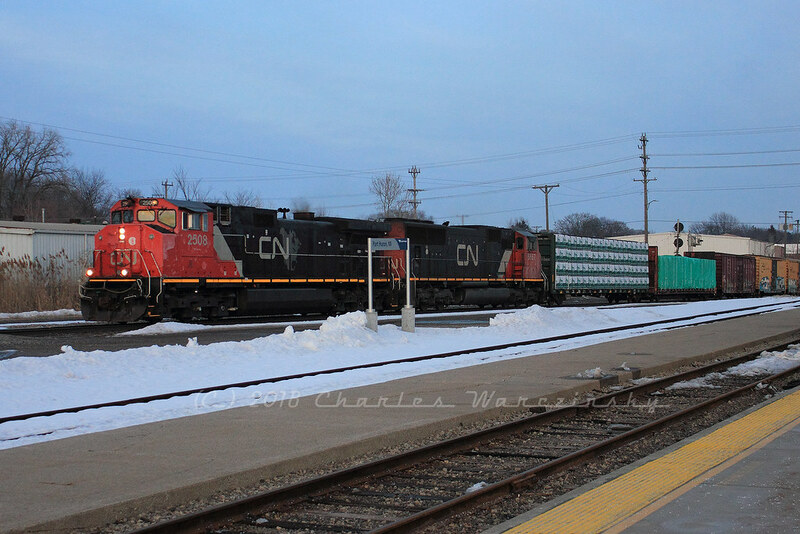 Q149 is a westbound doublestack train that originates somewhere in eastern Canada, runs through the St. Clair River Tunnel between Sarnia, Ontario, Canada and Port Huron, Michigan, USA, and terminates somewhere to the west (Chicago?). 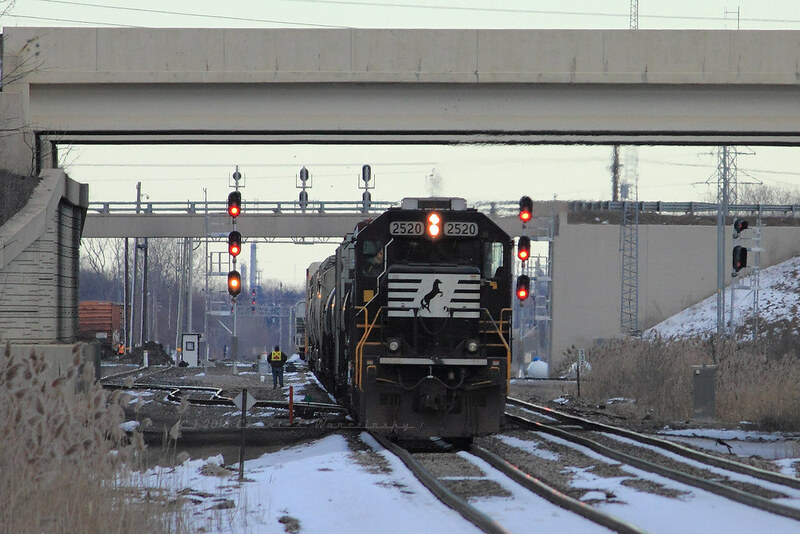 I quite often see 149 in Port Huron on my way to work in the mornings, but it was apparently running a little later these days, either due to the holiday or delays suffered along its route. My first encounter with 149 was on Christmas Eve. 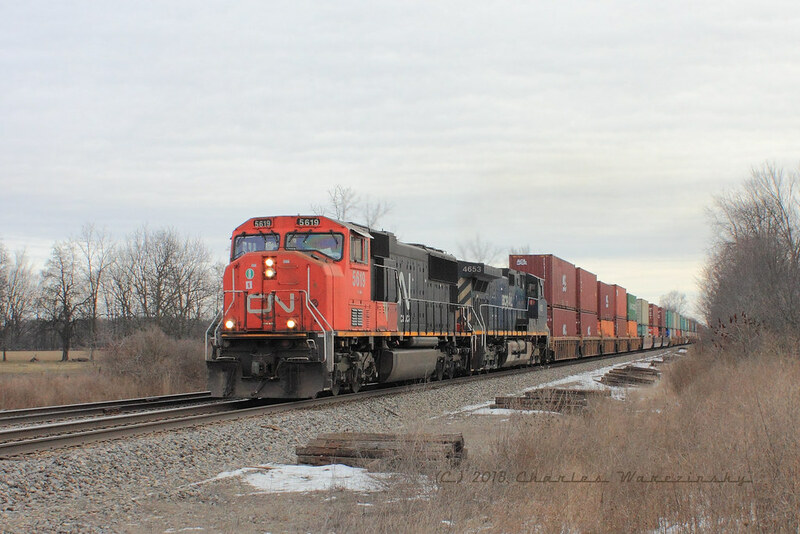 I happened to have my camera with me on my way to family Christmas at my parents’ house, and anticipating a little extra time to see what I could see of railroad movements in the area, I left my house early. I “got lucky” as I approached the I-94/I-69 interchange when I caught 149 marking up to go west. With plenty of time to scout a shooting location, I caught the train holding the main, just west of the east end of the siding at Emmett. Most of the snow we’d received a week or two prior had melted, with just a few remnants sticking around. The snow wasn’t done for the year, and by the time I had planned to leave for the Christmas Eve service at the church I attend, the road conditions had deteriorated to the point that I wasn’t sure I’d be able to get home afterwards. Just making my way home to Marysville was difficult enough. I had plans to spend a couple days with a friend from the Bethel days, in north central Indiana after Christmas. 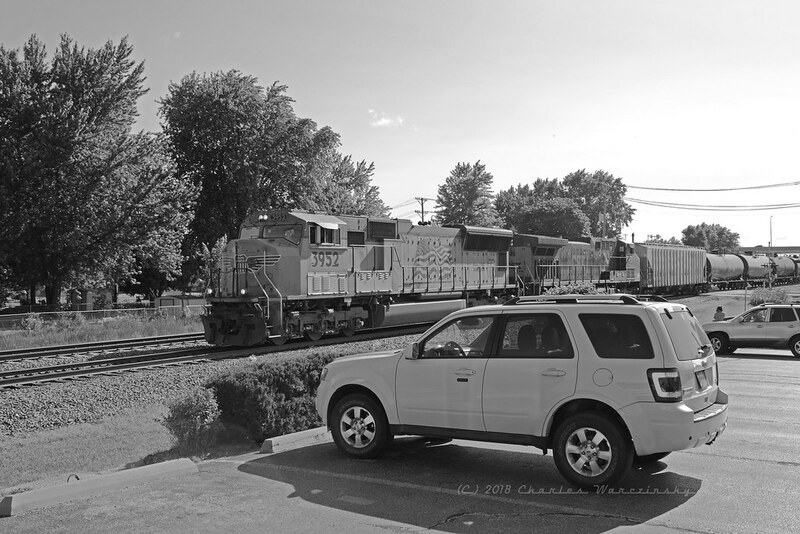 As I began the journey south and west, I stopped for gas near West Tappan (the west end of the double track leading west from Port Huron), and while I was stopped, I could hear a train departing for the west. After filling the tank, I too headed west, but now with a planned pit stop at Emmett to catch this train passing through town. Q149 had a bit more power on this day and one of the blue GECX leasers was included in the consist. Most remarkable about the view though, is the amount of snow we’d received a couple days before. On Christmas Eve there would have been hardly any snow visible in this image. As February rolled by, I found myself in desperate need of a change of scenery, but my schedule and the weather wouldn’t allow it. 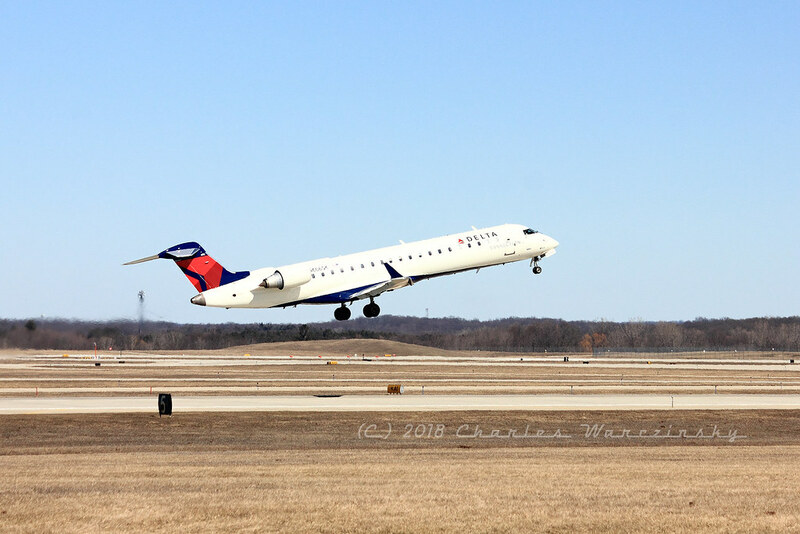 I had to settle for a short trip “up north” (where I’m from, up north doesn’t start until you’re at least north of the Bay City metro area) about halfway through February. I made it all the way up to Standish, where I finally got to see the big, new elevator that was built a couple years ago. 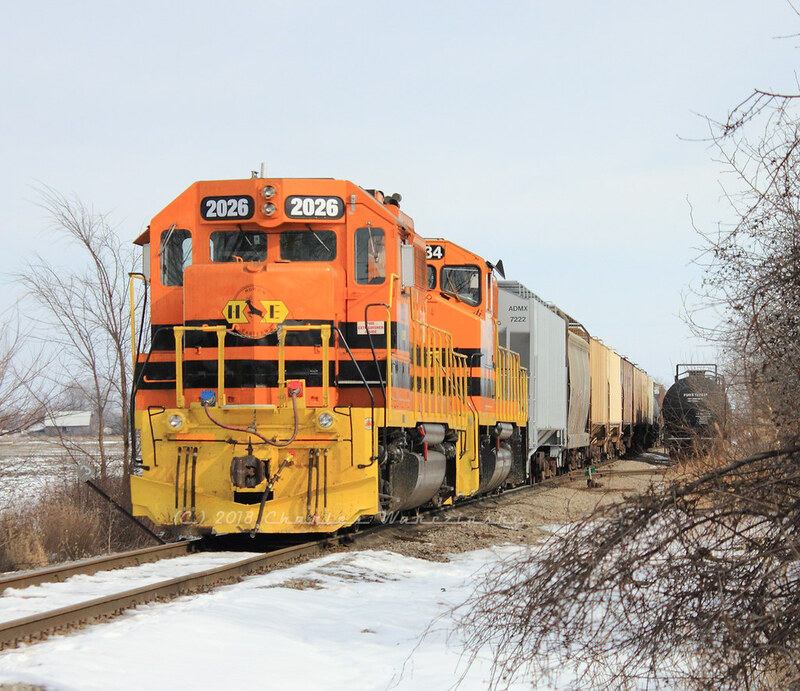 I didn’t get many pictures as the point of the trip was to drive, not to use the camera, but I did catch a pair of orange Huron & Eastern diesels sitting east of Saginaw, waiting to exchange the train behind them for freight bound for the east end of the HESR system. The following day I think I hit a drive through for dinner and took it up to the Amtrak station at 16th Street, just outside the St. Clair River Tunnel. Unlike some days, I did manage to catch a train this day, an M385-18(? )(again, there are some other numbers in the symbol, but I don’t know what they are). Work’s been crazy this year, especially the past several weeks, and I was finding that if I went in for a few hours on the weekend, I was able to get some of my really hot projects taken care of. 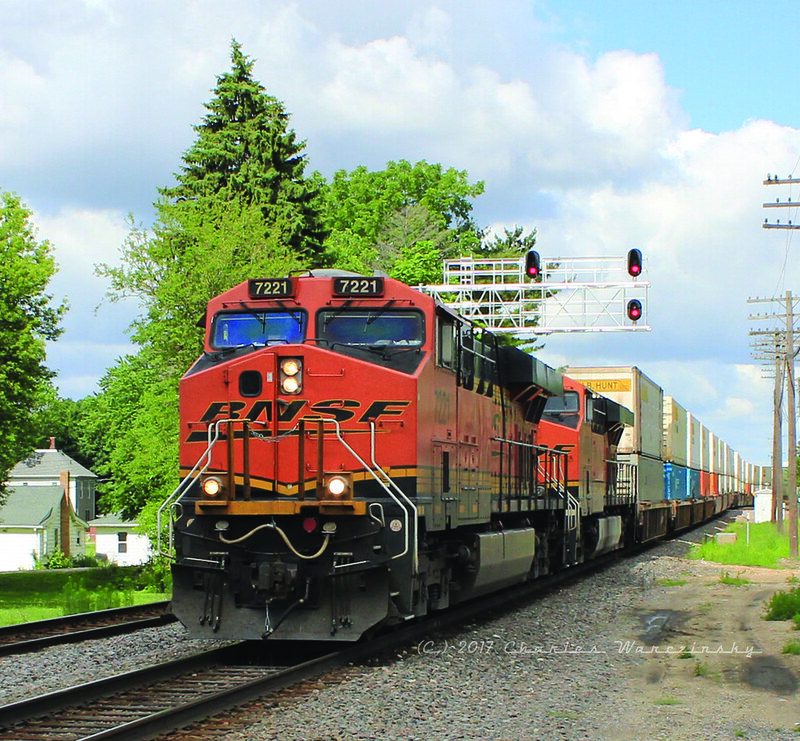 Coming home from work one weekend afternoon, I noticed a train on the west end of the Port Huron yard with a single locomotive. That’s not unusual, but in my experience, it is unusual for that single locomotive to be a Norfolk Southern (standard cab) SD60. I heard later that the unit is junk, but someone evidently considered it sufficient for that day’s edition of L501 (and some other numbers).